The SFD's efforts to support; Village Cooperative Councils (VCCs), local authorities, community committees and active associations have been largely demonstrated during the current situation in 2015. In that year, commitment by government and international community to fund development was the lowest so that the development institutions’ response was weak; most the ongoing and planned projects have not been completed. Even during the country's recent precarious conditions, these community-based structures continued to serve their communities voluntarily. All this has encouraged hundreds of rural communities (previously supported by the Empowerment for Local Development program) not to wait for eternal support and to disembark community-based initiatives to meet its needs during the currently precarious security and economic conditions. 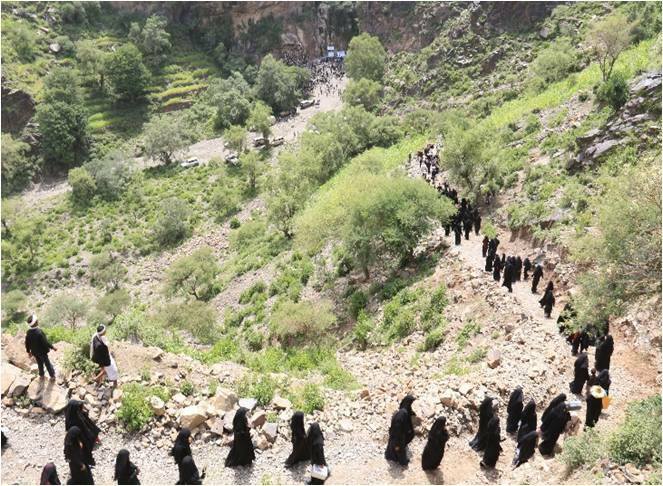 These initiatives have provided a clear-cut evidence of the importance of working with local communities, particularly during the difficult circumstances presently experienced throughout Yemen. SFD's Empowerment for Local Development (ELD) Program aims to reinforce the capacities of local authorities and involve local communities in trained and effective structures such as the Villages' Cooperation Councils (VCCs) and sub-districts' committees, as well as revive and encourage self-help initiatives in the targeted districts since 2007. The SFD's experience and the learned lessons have helped strengthen the community structures in SFD's different branch offices, and led to supporting those structures and documenting their efforts. During the first half of 2015, the country experienced hardships that negatively affected all local communities in the different economic, social, and health aspects. The deterioration of the political crisis and security conditions has been negatively reflected upon communities in different areas where all basic services have stopped and income declined. Tens of thousands of families were forced to leave their homes to other more secure areas away from the areas of confrontation and bombardments in different governorates, thus adding more burdens upon the host originally poor communities. Many districts formerly targeted by ELD in a number of governorates were directly affected inwardly or outwardly either by armed confrontation or population displacement. These include the districts of Haradh , Abs, and Kuaidina (in Hajjah Governorate), most districts of Al-Hodeida and Amran Governorates, Wousab (in Dhamar), Mukairas (in Al-Beidha') , and most districts in Ibb, Taiz and Hadramout Governorates, as well as Tuban District (in Lahj). All these changes and events represented a real test for all community structures to illustrate their capacities in contributing in confronting some of the crisis issues, and continuing the activation and organization of communities' efforts in respect to self-help initiatives that rely on the communities' efforts and potentials, as well as increasing the impetus of such efforts for dealing with the needs' gap. The ٍSFD monitoring of activities by these structures conducted during January to mid-June showed that their' roles were positive the matter which reflects the SFD' impact on building the structures' capacities. ٍSFD monitoring reports on self-help initiatives in a number of districts within the ELD program indicate positive results. In only 34 districts located in 11 governorates, the total number of initiatives implemented reached 1998 at a cost of 155 million Riyals despite the war and deterioration of different fields. These structures exert their efforts with high impetus in implementing diversified self-help initiatives, as well as relief efforts for the population affected and displaced. The fields varied in infrastructure like roads maintenance, sewage, water, as well as human development including the implementation of training courses, and community aspects related to relief for displaced population and providing humane assistance to them.